The Railway Ministry in collaboration with the Himachal Pradesh Government has decided to introduce special tour packages on the Kalka-Shimla rail route which will be celebrating its centenary on November 9. Mr Ramesh Dhuwala, a former Irrigation and Public Health Minister and staunch supporter of a former Union Minister, Mr Shanta Kumar, was today elected as chief of the BJP Kangra district unit. The unrestricted import of ‘gambier’, a substitute for katha (catechu), is posing a serious threat to the katha industry in the state. With the imported ‘gambier’ flooding the domestic market, the prices of katha continue to decline. The Himachal Pradesh Rural Development and Panchayati Raj Minister, Mr Sat Mahajan, has claimed that all vacant posts in the department would be filled within a fortnight. A religious state-level fair of Sirmour Renuka Mela commenced today afternoon here. Mr Virbhadra Singh, Chief Minister, Himachal Pradesh, inaugurated the fair and took part in the shoba yatra of Lord Parshuram which started from Dadahu. The Himachal Pradesh Board of School Education today notified the dates for declaration of the results of Classes VIII, X, plus one and plus two examinations conducted by the Board in September this year. Magu Ram (85), father of Himachal Vidhan Sabha Speaker, Gangu Ram, died at Shimla today. This was stated by Mr R.R. Jharuhar, General Manager, Northern Railways, while talking to mediapersons here today. Mr Jharuhar was here to inspect the preparations being made for the centenary celebrations. He expressed satisfaction with the arrangements and said it would be memorable event that could prove to be a turning point for the Kalka-Shimla route. Mr Jharuhar was in the town to oversee the arrangements for various events being organised to mark the centenary of the toy train. He ruled out any possibility of reducing the rail fare in the narrow gauge section on the plea that it was already incurring losses. He said effort was on to increase the volume of passenger traffic to make the train services economically viable. Replying to a question he said the extension of the Pathankot-Jogindernagar rail track was not feasible. He said the railways was willing to introduce tourism package in collaboration with state on the pattern of the silver package already implemented in Karnataka and Rajasthan. He said discussions were already on with the government in this regard. It had to be a coordinated effort involving state Tourism Department, Transport Department and hoteliers. He said the request of the state for constructing multi-storeyed parking lot at the old railway godown would also be considered. He said out of the 19 new trains announced in the Budget for northern region as many as 12 had already been introduced and the remaining seven would become operational by December. Regarding the celebrations he said the main function would be held at the extension railway station near the bus stand. Besides a commemorative stamp a book on the Shimla-Kalka track would also be released during the function. The important stations on the track would be illuminated and an exhibition of old photographs and tools would also be organised. Mr Jharuhar further said for the tour package to succeed the government must also make efforts as this would involve providing lodging to the tourists as well as arranging for their road travel to spots like Kufri. He indicated that discussions on this issue had already been held between the government and railway officials and the state government, too, was interested in introducing this package as it would be helpful to the tourist industry. He said several proposals or ideas were in mind for the rail tour package. 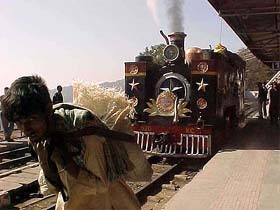 In this context, he said a picnic train could be introduced for schoolchildren on the Shimla-Kalka route. Replying to a query, he said there was no proposal to extend the Pathankot-Joginder Nagar section up to Kangra as had been demanded by the state government. He said due to the terrain and from the engineering point of view it was not possible to extend the route. Regarding according the heritage status to the Shimla-Kalka rail route, Mr Jharuhar said so far the railway ministry had not put up any proposal before UNESCO but perhaps in the centenary year the proposal could be forwarded. He said so far only the Darjeeling route had been accorded the heritage status and two more proposals of the railways was pending before UNESCO. These proposals were according the heritage status to the Nilgiri rail route and the 116-year-old Chattarpati Shivaji building of the Mumbai VT station. Mr Ramesh Dhuwala, a former Irrigation and Public Health Minister and staunch supporter of a former Union Minister, Mr Shanta Kumar, was today elected as chief of the BJP Kangra district unit. He defeated Dr Rajan Shushant, a former Revenue Minister and loyalist of the former Chief Minister, Prof P.K. 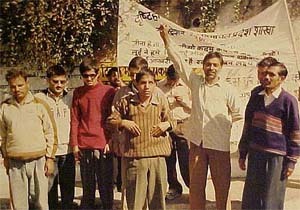 Dhumal, in a direct contest held here. Declaring the results, the returning officer, Mr Suresh Bhardwaj, said Mr Dhawala polled 200 votes and Dr Shushant polled 124 votes. One vote was declared invalid. Mr Bhardwaj said efforts were made till last moment for a consensus candidate and both Mr Shanta Kumar and Prof Dhumal were approached. He said Capt Atma Ram, Mr Des Raj and Mr Ved Dhiman were also elected unopposed for the state BJP council. The elections were held in a surcharged atmosphere when hundreds of the supporters of both the factions thronged the Gupt Ganga premises in the morning, but the day went off peacefully. The unrestricted import of ‘gambier’, a substitute for katha (catechu), is posing a serious threat to the katha industry in the state. With the imported ‘gambier’ flooding the domestic market, the prices of katha continue to decline. Over the past one year the average price of katha has come down from Rs 380 per kg to around Rs 300 per kg. There was a little hope of the price stabilising as the imported ‘gambier’ was available at very low rates ranging from Rs 80 to 95 per kg. The difference in the prices of ‘gambier’ and katha, which is manufactured from khair wood, was so large that the indigenous katha industry was in no position to compete. Consequently, a large number of ‘kathta bhatti’ operators have wound up their units, while the three big units have scaled down the production level. This in turn has affected the khair growers who were not getting remunerative returns even after lifting of the ban on the export of khair wood by the state government. ‘Gambier’ is primarily required by the tanning industry as a pigment dye but it is being increasingly used as a substitute for katha even in edible items like “pan masala”. The only way the industry could be saved from the impending doom is to impose a complete ban on the import of ‘gambier’, maintain the katha manufacturers. Alternatively, the government should impose maximum duty to discourage imports. They want the state to take up the matter with the Centre. In all, nearly 50,000 persons are directly or indirectly dependent on their livelihood on the industry. Besides, khair is the only cash crop of lower hills and the farmers sell trees annually to supplement their income from agriculture. The katha season has only begun and the prices are likely to come down further. A true picture will emerge by the end of March. Talking to the mediapersons here last evening he said that the state government had decided to fill 12 posts of Block Development Officers (BDOs) and two posts of District Panchayat Officers immediately as the functioning of Rural Development and Panchayati Raj Department had been hit due to these vacant posts. He said that the Vigilance cell of the department had received 482 complaints of different nature out of which 55 had been disposed of and the remaining would be settled by December 24. “The cell has found 28 panchayat pradhans involved in financial irregularities who have been suspended by the department and 12 pradhans were declared disqualified due to encroachment on government land.” he added. The minister added that the government had completed the survey of the families living below poverty line. “As many as 2.86 lakh such families have been enrolled,” he said. He also heard the grievances of the people of his Assembly constituency and settled 200 complaints out of 265 on the spot. A religious state-level fair of Sirmour Renuka Mela commenced today afternoon here. Mr Virbhadra Singh, Chief Minister, Himachal Pradesh, inaugurated the fair and took part in the shoba yatra of Lord Parshuram which started from Dadahu. A large number of people also participated. A large number of devotees would take a holy dip on the occasion of ‘Devothan Ekadashi’ tomorrow. The Chief Minister also inaugurated development exhibitions at the fair. A spokesperson of the board today said that the results of the middle examinations would be announced on November 6 while results of the matriculation would be declared on November 27. The spokesperson added that results of plus one would be declared on November 20 and plus two results on December 2. The results would be available on the website of the board hpeducationboard.nic.com., the spokesperson added.